The Cascadia Community Builder Award recognizes a person who has made an outstanding contribution to the free software movement in the Cascadia region, and this year's winner is Bill Wright. The award was presented in person on Saturday, November 12 at the Seattle GNU/Linux conference (SeaGL). Wright was chosen because his tireless work as a founding organizer for Linuxfest Northwest has been instrumental to growing the free software community in Cascadia. In 1968, The Great Northern Railroad hired Bill, then a student at Western Washington University, because of his computer experience, which at that time consisted of using punched cards and perforated paper tapes. Bill became interested in Linux and the open source community in the late 1990s. With a few other computer nerds, he helped start the Bellingham Linux User Group in 1998 and its first LinuxFest in 2000. As BLUG and LFNW's Treasurer, Bill has been involved with organizing and community outreach ever since. Wright's positivity and dedication exemplify the kind of impact the Cascadia Community Builder Award was created to highlight. William Hale, who nominated him for the award, said, "As President of LinuxFest Northwest, Bill tables at other events and is always a welcoming face." 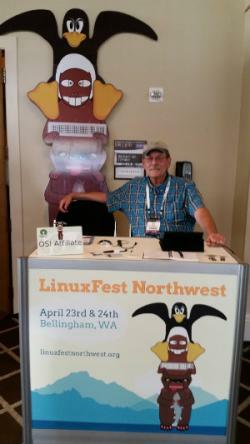 "Linuxfest Northwest reaches a huge number of people," said Emily Dunham, who serves on the award committee. "Bill is a great example of what the award is about." The award committee hopes that Bill Wright's tireless work will continue to inspire other free software activists in the Cascadia region.